We are also a full service Real Estate Sales Company. Selling properties not just in Country Clubs for the entire Highlands Plateau. Let us help you find you own piece of Highlands to call home. Contact Alicen or Craig prior to arrival. Highlands is a place with an abundance of unique things to do. From Arts and Culture, Outdoor and Recreation, World-class Musicians, Workshops and Lectures, to indulging in the wonderful Culinary scene, there is always a wide variety of events to capture the interest of any visitor or resident of Highlands NC. The events calendar is constantly updated so check back often or download the Highlands phone app.There is always something to do. Our merchants are full of ideas and are willing to assist. Combine an event with a day of shopping, a fine dining experience or a stay in one of our fine accommodations. Experience Highlands at your service. Call ahead for reservations! When it comes to renowned restaurants none can compare to the culinary excellence of Highlands, NC. Wine and dine at one of the many Wine Spectator Award Winning Restaurants. There is everything from formal fine dining to places that will take you on a culinary journey around the world, And if you are looking for a causal lunch or dinner we have that too everything from burgers, pizza, sandwiches, BBQ and more. The free Highlands Newspaper has the best list of Hikes - Waterfalls- Day Trips. Visit their page here and plan some great outdoor adventures while you are in the mountains! Highlands Free paper comes out every Thursday be sure to pick up your copy! Highlands Chamber of Commerce great for all the local area information and events. A great source for planning your trip. Check here for Camps, Lectures and Events The Laboratory, Nature Center, and Botanical Garden are part of the Station, which is supported in part by the Foundation. The three panels of the logo symbolize these entities: The Nature Center is represented by the salamander, the Botanical Garden by Oconee Bells, and the research and educational dimension of the Station and Foundation is represented by the central panel signifying the ecology of the Highlands Plateau. Located in the mountains of Western North Carolina, Highland Hiker has been outfitting hikers, fishermen, and travelers for over 35 years. We carry a wide selection of gear, clothing, and shoes for backpacking, fly fishing, camping, hiking, adventure travel, and much more. We have 3 retail locations on East Main St. in Highlands, NC & one location at the Crossroads in Cashiers, NC. As HighlandHiker.com grows, we will be adding an on-line catalog. To help you find what you are looking for, you can call us at (828) 526-5298 and place your order over the phone with our friendly and knowledgeable staff. Welcome to Jackson Hole Trading Post & Gem Mine. We`re located in waterfall country 1/3 mile above the breathtaking Cullasaja Falls on Hwy. 28 & US 64 halfway between Franklin and Highlands, NC on one of the most scenic byways in the USA. Jackson Hole Trading Post & Gem Mine has been Family Owned & Operated since 1977. We offered the cleanest mine around with a covered flume to search for your treasures rain or shine. Highlands Country Club golf courses are all private, however there are several public courses within a 20 to 30 minute drive of Highlands. 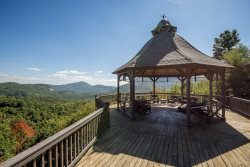 Highlands NC and Cashiers NC information, things to do calendar, shopping, dining, and the arts, including listings of waterfalls, hikes and homes for sale.